A tribute to Williams in her hometown. 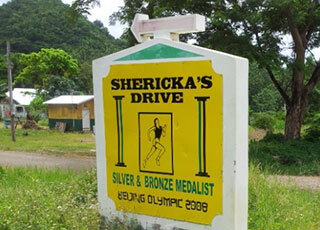 Born in Black River on Jamaica’s south coast, Shericka Williams, a former St. Elizabeth Technical High School representative, who used to be called ‘Wire’ because of her then tiny frame, needed very little time to make her mark on the world scene. She helped successive Jamaican 4x400m relay teams to silver medals at the 2005 and 2007 World Championships. In 2008 she returned 49.69s to win a silver medal in the 400m at the 2008 Beijing Olympics, where she also helped her team to bronze in the 4x400m. She has run a PB 22.50s in the metric half lap.